Hi there! For those of you that don’t know me: I’m Olivier Bos. I’m a guy who is passionate about classic cars, motors and pretty much everything else motorized on wheels. It’s not only the car itself, it’s the story that goes with the car. Where has it been, who drove it and how I could turn it into your dream car. Get yourself into the most iconic 4×4 vehicle, a Land Rover Defender, or race down the lane with a classic Porsche. Whatever you want to do, I’ll find you your classic. We always have cars for sale and projects going on. Contact us today for all the possibilities. History: how did it all begin? Oliver’s love and passion for everything on wheels started early. He was about 15 years old when he bought his first moped: a Honda C50. He restored this back to original and it made clear to him that he loved doing this sort of projects. As expected, it didn’t take long to find himself buying the next project and the next project, and so on. In the next years, he rolled into restoring classic Minis. From having friends with Minis who needed help, to upgrading his own vehicles and doing complete restorations. This hobby got a little out of hand and that’s when he decided that it was time to turn his hobby into his own company, Forest Mini’s, in 2002. Making you happy with your vehicle; that’s what drove him and it still does! We invite you to take a look in the sold section to see what we and our customers are passionate about. It was around 2010 when he decided that he wasn’t only going to stick to Minis and soon there were American muscle cars, Porsche, Volkswagen vans, Jaguars and the most iconic 4×4 vehicle: the Land Rover Defender. It was that time that he fell in love with this iconic 4×4 beast, which could climb mountains, storm through a desert and has no fear of mud or rain. When you see Oliver climb in a Defender, he can’t help but smile every time. So naturally, in 2013 it was time to start a new company alongside Forest Mini’s. 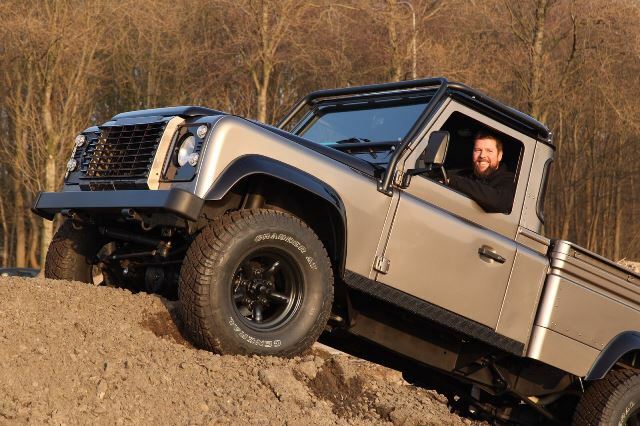 As one of the founders, Oliver turned his idea, knowledge and passion of restoring old Land Rover Defenders into a company named TopHat B.V.. After a successful start, Oliver (as usual) needed more and since TopHat was founded to focus solely on Defenders; they parted ways at the end of 2014 and Oliver moved on to do more, more of what he loves; finding you your classic, not just a classic defender, any classic. At the end of 2016 Oliver decided that the name Forest Mini’s didn’t suite the company anymore and that’s when Olivers Classics was born. He just continued with what he was already doing: building and selling badass Defenders, being the supplier of Defenders to some of the biggest builders in the US and finding you your classic. He can often be found in the U.S., but when he’s not, he’s probably on the road or at home which is based in the Netherlands. The office is based in Nederhorst den Berg and the workshop in Weesp, which both are about 30 minutes from Amsterdam. The workshop is specialized in the maintenance of Land Rovers and there he works with one of the best mechanics. If you want to get to know or meet Oliver, please feel free to contact us via the contact form. Or just give him a call. Like we said, he is often found in the U.S., so if you want to meet in person, he is happy to make the arrangements to meet you, whenever he is Stateside or whenever you’re in Europe.